North Korea unveiled details of Monday’s short range missile launch into the East Sea, saying it was a “new type large-caliber multiple rocket launching system (MRLS)” on Tuesday via the state run newspaper Rodong Sinmun. 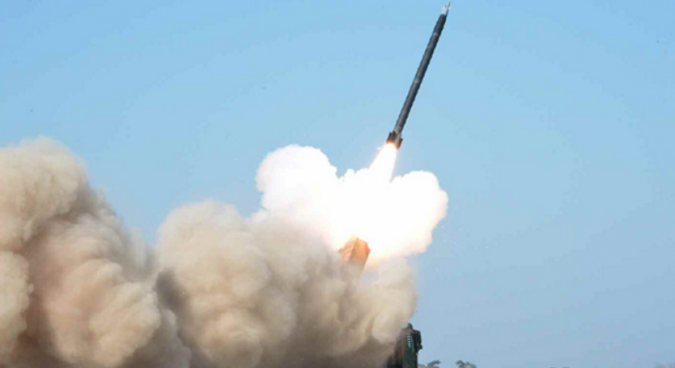 The South Korean Joint Chiefs of Staff (JCS) and the Ministry of Defense (MND) speculated the rockets were MRLS with a 300mm caliber, at a regular press briefing on Tuesday. Previously, observers guessed the missile from North Korea seemed like an improved version of KN-02, a surface-to-surface missile. Kim Jong Un visited the launching site to supervise the “final test before the actual deployment,” the paper reported. Kim emphasized the test was to target enemies in the operational theater in “the southern part of Korea,” saying there should be further developments of new weaponry. “They would bring the greatest heyday in the development of national defense science this year when the Seventh Congress of the Workers’ Party of Korea is to be held by steadily intensifying the work for developing new Juche-based weapons of Korean style,” Kim said. The missile flew 200 kilometers and reached an altitude of 50 kilometers, according to the JCS. The image of the missile and the truck seems very similar to the image of the 300mm MRLS with that North Korea released on March 4. “It looks like it uses solid fuel,” David Schmerler, research associate at the James Martin Center for Nonproliferation Studies, told NK News, based on the images published on the two dates. Solid fuel shortens the preparation time for launch, making it difficult to detect. NK News previously reported the truck used for the launchers came from China, but the spokesperson of the MND declined to confirm its origin, simply saying it might have entered North Korea before the sanctions. While MND spokesperson said the missiles are unlikely to be deployed for the actual attack, the system’s capacity seems considerable. 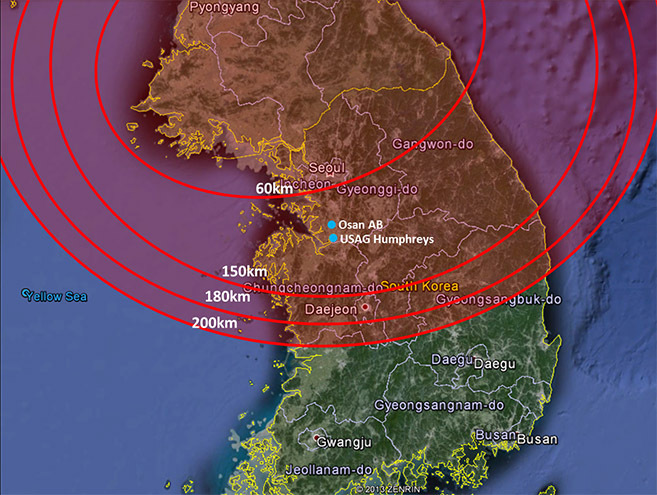 “Unless North Korea also fired something else yesterday, they can reach 200km with an MRL, which is very impressive,” John Grisafi, NK News director of intelligence said. South Korea’s 239mm MRLS has reported a range of about 80 kilometers, while the U.S. military’s 227 mm MRLS has a range of 120 kilometers, Grisafi said. The larger the rocket is, the longer the missile can travel. Two hundred kilometers from central North Korea could reach further than Daejeon, a city in the middle part of South Korea. Numerous, simultaneous launches from MRLS would make it difficult to block them with missile defense systems like THAAD. “The missiles launched by MRLS fly lower than the minimum distance which THAAD can intercept,” Kim Min-seok researcher of the Korea Defense and Security Forum told NK News. 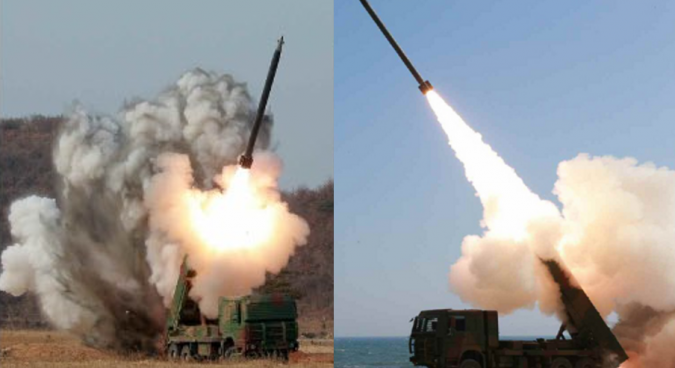 Following the test launch of the MRLS 300mm on March 4, North Korea appears to be diversifying its missile stocks, including two Scuds on March 10 and mid-range Nodong missiles on March 18. 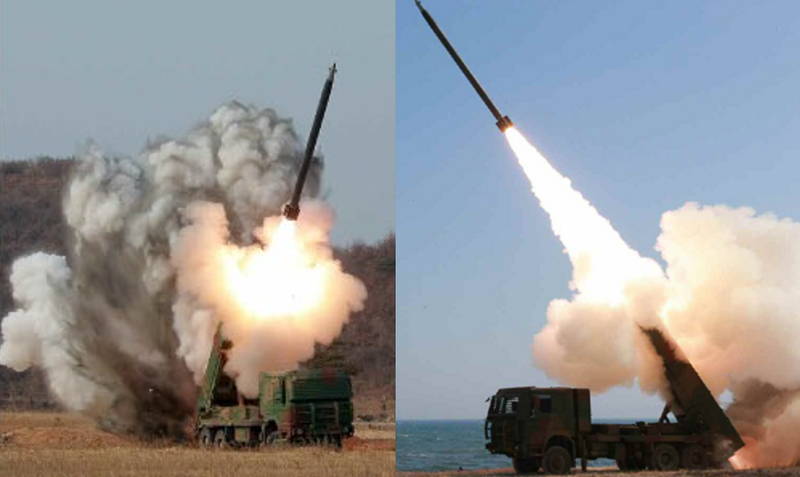 Professor Kim Dong-yup from the University of North Korean Studies said Pyongyang is replacing its Scud-B missiles with the new MRLS and KN-02s, which have solid fuel and mobile launchers. Schmerler also added that North Korea is able to use solid fuel for the KN-02 but not yet for long-range ballistic missiles. Subscribe to read the remaining 539 words of this article.